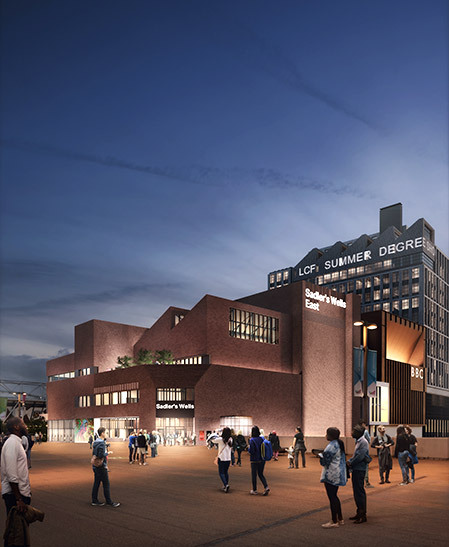 Sadler’s Wells is to open an additional mid-scale space in east London in 2022. Our new theatre building will be at the heart of a new cultural and education district in Queen Elizabeth Olympic Park, where we will sit alongside the BBC, UAL’s London College of Fashion, V&A and UCL. Together with our partners, we want to develop a new, global centre for creativity, learning and innovation, which will open up opportunities for everyone who visits, lives and works in east London. The area is already celebrated for its diverse cultural mix and thriving community of creative people. We are excited to be working with local community and cultural organisations in the run-up to opening to deliver performances, education projects, events and activities. Why are we opening another theatre space? Some of today’s most exciting dance – both in the UK and internationally – is being created specifically for mid-size spaces with a 500-seat capacity. London does not currently have this type of dance theatre. The new Sadler’s Wells East will enable UK audiences to experience the most innovative choreography made today, offering a platform for mid-scale companies to tour to London. The production facilities we will have at the new theatre will also help us stimulate the creation of new mid-scale work that can tour across the UK and internationally. What will be on offer? There will be a year-round programme of dance in the new venue, with the broad range of styles that Sadler’s Wells is known for – from the cutting-edge and challenging to shows that offer delight and entertainment. We want to open our doors to the widest range of participants and audience members. International companies will feature as well as local artists, and there will be regular family offering at Christmas and Easter. Our learning and engagement programmes for schools and communities in the east London boroughs are also being vastly expanded. What will be in the new building? As well as a fully equipped auditorium, the new venue will include six studios and support facilities designed specifically for dance. These will be used for artist development and training, and for the creation of work at any stage in its development. These spaces will allow us to establish a new centre for choreographic practice and a hip hop theatre academy, both of which will be the first of their kind in the world to be run by a theatre. The public areas of the new theatre will welcome people throughout the day and into the evening. In addition to the dance programme shown in the auditorium, we are planning to offer opportunities for performance elsewhere in the building and in the spaces outside too. Sadler’s Wells is raising money towards the completion of the new theatre building, and its artistic and learning programmes. To find out how you can help, please contact Phoebe Reith, Director of Development, on Phoebe.Reith@sadlerswells.com.